2014 CrazyFly Thunder 6'2" Kite Surfboard, Amazing Big Wave Performance. 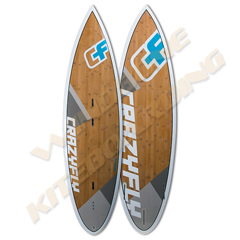 The 2014 CrazyFly Thunder 6'2" Kite Surfboard from CrazyFly Kiteboarding offers precise powered control in an ultra durable kite surfboard with top quality materials, construction and performance. 2014 CrazyFly Thunder 6'-2" Kite Surfboard - "Agility and response in waves.."
The 2014 CrazyFly Thunder 6'2" Kite Surfboard is designed for bigger and more powerful waves. It has a rounder tail and a thruster fin set up, and the board offers amazing control when the surf gets a bit bigger and in cross-off conditions. If you want to ride with tons of power in high speed turns with your board under control, then the 2014 CrazyFly Thunder 6'2" Kite Surfboard is your best choice. The Thunder will get you onto the wave of the day and give you the control that you need to ride it all the way through to the beach. The 2014 CrazyFly Thunder 6'2" Kite Surfboard has a thruster fin set up for direct control and superior speed. In addition, all CrazyFly surfboards come with high quality accessories: self-stick EVA footpads, surf straps, and original Futures® fins made in USA. $125 Kite Coupon Code/Credit good towards the future purchase of any new in-stock kitesurfing kite 7 Meter or larger.. or 5% Off Board Coupon for any new in-stock kitesurfing board offered in store (offer good for: single use/purchase, new non-sale items only, in-stock items available in store, coupon/codes expire 60-days from issue date, cannot be combined with other offers, limited to availability, offer may end at any time) Contact Us for details, questions, and/or stock availability -"if you don't see it just ask.."
***We have a large selection of latest Demo Gear from F-One, RRD, Crazyfly, Ocean Rodeo, Litewave, HQ, Peter Lynn, Epic, Boardworks, and more -Contact Us for latest demo gear availability and special requests..
***WindBone 'Buy-To-Try' Demo Trail Purchase Program offers a two week trial of brand new gear from purchase arrival date, gear can then be returned for full store credit exchange refund or 'Walk-Away' refund less 15% Demo/Rental Fee (credit value less any excess wear or damage, less shipping) **Offer Limited to Select Kites / Boards Only -Contact Us for availability, options, and full details on program.. Most Items in Stock, but Stock/Availability may vary at times on certain Kites, Boards, or Special Items, every effort will be made to get your order shipped out ASAP -prompt contact will be made if any availability or ship lead time issues arise.. Feel free to Contact Us with any questions..
Also, please Contact Us for all your F-One, RRD, Crazyfly, Ocean Rodeo, Peter Lynn, Epic, Litewave, HQ, Mystic, Broardworks, Bravo Elec Kite Pumps, Trainers, Kitesurfing Lessons, and General Kitesurfing needs -if you don't see it just ask.. (some used & closeout gear currently available).. Extensive Demos also available in the NJ-NY-PA-Metro area (F-One, Crazyfly, RRD, Ocean Rodeo, Peter Lynn, Epic, Boardworks, & Litewave Demo Test Center).. The sport of Kiteboarding can be extremely hazardous/dangerous without proper instruction/experience -those new to the sport please seek professional instruction prior to engaging in the use of kitesurfing equipment..
2014 CrazyFly Thunder 6'2" Kite Surfboard from WindBone Kiteboarding your Authorized CrazyFly Kiteboarding Dealer Specialists.